That tops the inflation adjusted high of $102.53 set in 1980. Oil first inched over $100 to welcome in the new year on January 2nd and has hovered around $100 since then, routinely spiking into new record territory. Now we've blown past the final record: the inflation adjusted highs reached in the '80s. This news comes as analysts predict $4.00 per gallon gasoline when refiners switch over to reformulated blends in Spring. Of course, you and I already know that. We see it every time we drive past a gas station, or god forbid, actually pull in to fill up our tanks! You'd assume President Bush would be clearly aware of the state of gas prices as well, given how much they impact average Americans every day. Well, you might assume that about another president anyway... I wasn't too shocked to learn that President Bush is actually completely clueless that gas prices are soaring towards $4.00! MR. BUSH: Wait, what did you just say? 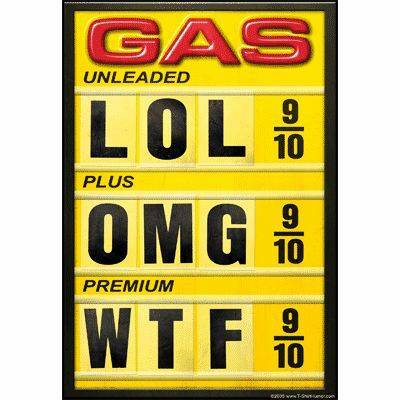 You’re predicting $4 a gallon gasoline? Q: — $4 a gallon gasoline this spring when they reformulate. MR. BUSH: That’s interesting. I hadn’t heard that. Like why President Bush has routinely blocked the US Congress's fiscally responsible attempts to re-invest wasteful oil subsidies to kick-start new sources of clean, homegrown renewable energy. Three times now, the House of Representatives of the 110th Congress has passed bills that would end wasteful subsidies to oil companies designed to spur domestic oil exploration at a time when oil priced in at about $20.00/barrel. With oil prices at record levels over five times higher than when Bush took office, it's simply fiscally irresponsible to shower an industry recording record profits with taxpayer subsidies while denying the most promising and fastest growing clean, homegrown renewable energy technologies critical incentives that spur their growth. The House passed their third attempt to correct this irresponsible tax spending and shift funds to extend critical renewable energy and energy efficiency tax credits, as well as support purchases of plug-in hybrid electric vehicles. Perhaps the third time's a charm, but this victory could be short lived, with President Bush again threatening to veto and a Republican-led filibuster in the Senate expected (again!). But I guess if President Bush doesn't have a clue what oil and gasoline prices are really like these days, he can be forgiven for ignorantly and irresponsibly defending oil subsidies to Exxon, Chevron, ConocoPhillips and friends... These oil companies are incidentally reaping record profits off of the record prices paid by every-day Americans at the pumps, all while the economy tanks... But maybe President Bush doesn't know that either. So maybe we should go light on President Bush... After all, he doesn't know any better! But WE, the every day American tax payer do! WE know that lavishing subsidies on established and highly profitable industries is a pretty poor use of taxpayer money. We ALSO know that subsidizing the energy industries of the past will not help us solve the energy challenges of the future! To do that, we're going to have to be Energy Smart! We're going to have to invest in new, clean, domestic energy sources like wind, solar, geothermal, energy efficiency, new 100+ mpg plug-in hybrid cars and more in order to have an energy supply that is sustainable, both environmentally AND economically. WE know better, so let's let the Senate and President Bush know it's time to re-invest! Let your Senators know it's time to be smart with our energy subsidies. Tell the Senate to pass H.R. 5351 the Renewable Energy and Energy Conservation Tax Act of 2008 so we can take a step towards a sustainable, prosperous and secure America! Accor North America announced today a new agreement between its Sofitel Hotels and wind energy supplier Community Energy, Inc. to purchase clean, renewable, wind energy for all nine Sofitel locations in the U.S. This purchase of wind-generated power in the form of Renewable Energy Certificates (RECs) qualifies Sofitel Hotels as an EPA Green Power Partner, making them the first hotel chain to choose green power for each of the brand's hotel locations in the country. "We're proud to step up as a leader in our industry and to do our part for the environment. Our customers recognize and value the commitment we've made to a safe and secure energy future. We hope others will follow our lead and make the choice as well," said Robert Moore, senior vice president of Technical Services for Accor North America. Sofitel has nine locations throughout the United States including two in Chicago and one in Los Angeles, Miami, Minneapolis, New York, Philadelphia, San Francisco and Washington D.C. These properties will buy a total of 1,527,000 kilowatt hours (kWhs) of renewable energy. Compared to the average generation mix in the regional electric grid, the environmental benefit from this purchase is equal to offsetting approximately two million pounds of carbon dioxide per year, the impact of which is equivalent to planting more than 800 acres of trees each year or not driving 2.36 million miles. This level of commitment makes Sofitel the first hotel chain to become an EPA Green Power Partner. "EPA applauds our corporate partners for protecting our environment by purchasing green power," said EPA Administrator Stephen L. Johnson. "By voluntarily shifting to renewable energy, Accor North America is proving you don't need to wait for a signal in order to go green." Following a year of unprecedented growth with more than $6 billion in cleantech investments, the Cleantech Forum XVI in San Francisco brought together nearly 1,000 attendees, marking the largest attendance in the history of the industry's premier event. Leading investors, entrepreneurs, and influencers from around the world exchanged ideas, recognized industry leaders and announced new initiatives to continue to drive growth in the cleantech industry. Cleantech Forum XVI is hosted by the Cleantech Group, LLC, founders of the cleantech investment category. Wal-Mart yesterday launched a new website inviting innovative clean tech companies to pitch their products to the retail giant. The new website aims to help the retailer identify and acquire emerging green technologies before they reach the mainstream. The company said that through this Cleantech Accelerator Project Wal-Mart will be able to use its purchasing power and financial clout to help accelerate the development of emerging green technologies. "The Cleantech Accelerator Project is another example of Wal-Mart's commitment to being one of the early adopters of technologies that can improve the environment and our business operations," said Matt Kistler, senior vice president of sustainability at Wal-Mart. "We believe that our partnership with the Cleantech Group will help us tap into a wide source of innovators who can provide us with fresh thinking." The company said it was initially seeking submissions from firms specialising in alternative batteries for forklifts, wind harvesting technologies, closed-loop water processing systems, sustainable building materials, and technologies for processing and managing organic waste, oil-based waste and household hazardous waste. Four countries, four cities and five corporations have become the pioneering founders of a bold new initiative to address climate change and the urgent need to de-carbonize the global economy. The participants are the first to join the Climate Neutral Network (CN Net), launched today by the United Nations Environment Programme (UNEP) in cooperation with the UN's Environment Management Group, as one inspiring solution to the challenge of rising greenhouse gases. The Network, a web-based project, is seeking to federate the small but growing wave of nations, local authorities and companies who are pledging to significantly reduce emissions en route to zero emission economies, communities and businesses. Over the coming months, intergovernmental bodies, organizations, civil society groups and eventually individuals will be invited to take part. The aim is a truly global information exchange network open to all sectors of society from Presidents, Prime Ministers and Princes to people from Pittsburgh and Sao Paulo to Poznan and Apia. Achim Steiner, UN Under-Secretary General and UNEP Executive Director, said today: "Climate neutrality is an idea whose time has come, driven by the urgent need to address climate change but also the abundant economic opportunities emerging for those willing to embrace a transition to a Green Economy". "This new initiative supports the formal negotiations under the UN Framework Convention on Climate Change. Here governments need to navigate the Bali Road Map to a successful conclusion in Copenhagen in 2009. The CN Net can assist in building confidence through demonstrable action at the national and local level on the art of the possible," he said. "The CN Net is also in for the long haul and equally aimed at mobilizing a broad-based response demonstrating that a transition to a low, even zero carbon future, can be a reality if inspiring and practical actions can be federated around the world," said Mr Steiner. The first four countries to partner are Costa Rica, Iceland, New Zealand and Norway. They, along with the initial cities and companies, represent a diversity of challenges and opportunities which have the potential to be replicated by others in whole or in part. "For Norway it is emissions from oil and gas that dominate whereas for New Zealand, agriculture represents 50 per cent of its current greenhouse gases," said Mr Steiner. With a new US president certain to climate change legislation within 2 years and many states now moving forward, carbon trading and finance has ratcheted up this year. Already, the first compliance trade for the Regional Greenhouse Gas Initiative was completed on February 14th, and investors are now circling the space to deploy capital. "Carbon Trading and Finance is accelerating in 2008 due to impending climate change legislation moving forward in DC next year. Investors are now much more engaged on learning about this emerging sector," said Peter Fusaro, Chairman, Global Change Associates. businesses are now emerging predicated on the monetizing of carbon credits. Wall Street banks and hedge funds are gearing up to provide the needed market making and financial services. This year's event has a stellar cast of pioneers in environmental finance and trading. It also brings together many of the exchanges active in the market including NYMEX, CCX, APX and Nord Pool. Investment banks are well represented by JP Morgan, Morgan Stanley and Fortis Bank. And the seven green hedge funds will present their expertise on emissions, renewables, water, and forest products. A coalition of more than forty leading US and European institutional investors, responsible for over $1.75 trillion (!1.2 trillion) in assets, has announced one of the most significant climate change action plans to date. The plans, unveiled at the Investor Summit on Climate Risk, hosted by the United Nations Foundation and Ceres in New York, include a huge commitment to clean technology, with the investors setting a goal of deploying $10bn to the sector collectively over the next two years. Other goals include a 20% reduction in energy used in property investment holdings over the coming three years. (IANS) State-owned Power Finance Corp Ltd (PFC) Thursday inked a memorandum of agreement (MoA) with West Bengal Green Energy Development Corp Ltd (WBGEDCL) to set up India’s first grid-connected solar power plant. The 2-MW photovoltaic plant would come up at Dishergarh Power Station Complex near Asansol in Burdwan district of southern West Bengal. “The unit will come up over 8.3 acres of land with an investment of more than Rs.410 million. The state government will take about Rs.400 million from the PFC to execute the project,” West Bengal Power Minister Mrinal Banerjee told reporters here. He said this solar power plant would be the first of its kind in South Asia. “We are expecting to complete the first module of the project by July this year and the second module will also be finished by the end of 2008,” he said. WBGEDCL is promoted by the state government for promotion and development of grid-connected renewable sources of energy. It is implementing renewable energy programmes of the central Ministry of New and Renewable Energy (MNRE) and West Bengal. MNRE has set for itself a goal to add an additional 14,000-MW of grid-quality power through renewable resources by the end of 11th five-year plan (2007-12). According to estimates, West Bengal has a potential to add 10,000-MW through renewable energy, including solar sources. At present, the installed capacity of electric power from non-conventional renewable energy sources in West Bengal is 76 MW. In addition to this, WBGEDCL has drawn up an action plan to add 400 MW of power through renewable energy sources by 2012. Banerjee said there were some projects in the pipeline for a solar energy park in Purulia district. “The solar energy park will have separate power projects by private investors and the total capacity would be around 30 MW. About 100 acres would be required for that,” he said. In Silicon Valley, a battle between neighbors has turned into a different kind of face off: solar energy versus trees. It turns out that growing redwood trees can actually be a crime in California, if they block solar panels... as one couple in Sunnyvale found out the hard way. David Gorn reports on a new kind of legal battle -- the struggle over who has the right… to sunlight. QUEST is a TV, radio, web, and education series by KQED that explores science, environment and nature in Northern California. Interstate Power and Light Co. said Friday it plans to reduce greenhouse gas emissions by retiring two coal burning electricity generating units in Lansing and switching a Dubuque power plant from coal to natural gas. The plans will only be implemented if the company, a subsidiary of Wisconsin-based Alliant Energy Corp., is allowed to build a new $1.5 billion coal plant in Marshalltown. The company expects to complete the regulatory application process and get an answer from the Iowa Utility Board this summer. That plant, if regulators approve it and it's built as scheduled, is expected to be operational in 2013. At that time two units at the Lansing Generation Station would be shut down and the Dubuque Generation Station would switch to natural gas. Interstate Power and Light President Tom Aller said any changes in employment levels will be managed through retirements or attrition. The changes would reduce carbon dioxide emissions by more than 800,000 tons a year, the company said in a statement. Developing countries will have to be given economic assistance if they are to be expected to considerably reduce their greenhouse gas emissions, a top UN official said Wednesday. "We have to recognise that developing countries can only be expected to engage if economic incentives are put in place," said Yvo de Boer, executive secretary of the United Nations Framework Convention on Climate Change (UNFCC). Boer said that a few countries such as the United States and Japan have contributed several billion dollars to a climate change fund to help other nations cut their emissions. "The World Bank is working to establish a number of new financial mechanisms. They have just created a new investment facility which the US has committed three billion (dollars) to...," de Boer said at a news conference. Japan has pledged 10 billion dollars to the fund. Developing countries could not be expected to accept mandatory targets on reducing greenhouse gas emissions, the official said. De Boer is in India to take part in the annual Delhi Sustainable Development Summit which begins Thursday. India has refused to accept binding cuts on its greenhouse gas emissions, saying it would slow down its economic growth and efforts to lift millions out of poverty. The official warned that emissions would increase considerably rather than reducing if timely action was not taken. "Economic realities are telling us that emissions without action will go up by 50 percent (by 2050)," Boer said. At last year's UN climate change conference, delegates delivered a roadmap which set out the framework for negotiations for a long-term agreement on emissions which will replace the landmark Kyoto Protocol that expires in 2012.
supply with clean, homegrown electric power. Randall Swisher. "This remarkable and accelerating growth is driven by strong demand, favorable economics, and a period of welcome relief from the on-again, off-again, boom-and-bust, cycle of the federal production tax credit (PTC) for wind power." existing U.S. incentive for wind power—in order to sustain this remarkable growth along with the manufacturing jobs, fresh economic opportunities, and reduction of global warming pollution that it provides." The U.S. wind power fleet now numbers 16,818 MW and spans 34 states. American wind farms will generate an estimated 48 billion kilowatt-hours (kWh) of wind energy in 2008, just over 1% of U.S. electricity supply, powering the equivalent of over 4.5 million homes. production capacity of solar and wind power generation plants. Partners, Canaan Partners of the US, and Siemens Venture Capital GmbH. a thorough study of the sector, has moved from theory to practice. EnStorage CEO Eran Yarkoni, CTO Prof. Emanuel Peled, and VP R&D Dr.
Comverge, Inc. , a leading clean capacity provider through demand response and energy efficiency, announced today that through their Enerwise subsidiary, they have entered into a strategic alliance with Eaton Corporation to bring demand response and managed energy service offerings to Eaton and its customers. The offerings include a combination of strategic consulting and energy efficiency solutions. The relationship establishes Eaton's Electrical Group as a recognized channel which will offer Comverge solutions to their customers. Eaton's Electrical Group had sales of $4.2 billion in 2006 and is a recognized leader in electrical control, power distribution, uninterruptible power systems and industrial automation products and services. "Eaton is committed to offering customers sustainable and renewable energy products and services through our PowerChain(TM) Management solutions. Demand response related service is at the forefront of sustainable solutions through conservation, energy reduction and energy efficiency. By combining Eaton's engineering services and energy management products such as Pow-R-Command(TM) lighting controls and Power Xpert(R) metering with Comverge demand response and energy efficiency programs, we are helping our customers 'go green'," said Frank Campbell, vice president of Global Sales for Eaton's Electrical Group. Comverge's solutions enable commercial and industrial customers to reduce energy costs, capture increased value from demand response and energy efficiency markets and take advantage of alternative power initiatives. Eaton will market these commercial and industrial solutions to their customer base as part of their overall energy management and environmental solution offering, thereby providing a strategic distribution relationship for Comverge. Additionally, Eaton will offer Comverge's residential solutions to its residential construction customers. Results from a year-long study on high-tech electricity meters found smart grid technology performed as intended, saving consumers about 10 percent on their bills while easing strain on the power grid. San Diego Gas & Electric (SDG&E) today announced that it has signed a power-purchase agreement with Esmeralda Truckhaven to supply 40 megawatts (MW) of geothermal energy to the region's electric system. This latest agreement will boost SDG&E's total geothermal energy supply to 60 MW produced from Esmeralda facilities located in Imperial County, Calif.
A megawatt is the equivalent energy needed to power 650 homes. "The Imperial County is a renewable mecca for our region's future energy supply," said Debra L. Reed, president and chief executive officer of SDG&E. "As we continue to aggressively seek out renewable sources of energy to meet the state's 20-percent-by-2010 mandate, we will look to renewable developers such as Esmeralda to help us expand our renewable energy footprint throughout the county." Geothermal energy is generated by using heat from beneath the earth's surface to form electricity. It continues to be the largest producing renewable source of energy in California that develops "green" electricity 24 hours a day. In addition to the Esmeralda contract, SDG&E added to its renewable-energy portfolio last week when the company received approval of its Envirepel agreement from the California Public Utilities Commission. The Envirepel agreement is for 1.5 MW of biomass energy to be produced at a facility being developed in Vista, Calif.
Today, five percent of SDG&E's energy-resource mix comes from renewable resources such as wind, solar, biomass and geothermal. SDG&E has continuously pursued renewable energy with market solicitations every year since 2002. In the most recent solicitation, developers bid more than 5,000 MW of renewable energy for a majority of projects that would be built in the Imperial Valley. The 2008 renewables solicitation will be issued later this month. Odersun AG, a leading developer and manufacturer of flexible thin-film CIS solar cells, modules and applications for power plants and building integrated solutions (BiPV), announced today that it has secured EUR 61 million ($90 million) of funding, including EUR 40 million from a Series B financing round and an additional EUR 21 million in grants from the federal state of Brandenburg, to build its second factory SunTwo. The financing was led by Virgin Green Fund (US/UK) with participation from PCG Clean Energy & Technology Fund (US) and AGF Private Equity (a member of Allianz Group, France), in addition to existing investors Doughty Hanson Technology Ventures (UK) and Advanced Technology & Materials (China). Odersun will use the funds to build its new factory. The solar company is focused on the mass production of standard solar modules based on proprietary roll-to-roll manufacturing process at competitive prices. Its products are uniquely positioned to address the overall cost structure of solar power plants and the requirements of the fast-growing market for building integrated photovoltaic (BiPV). "Our modules can be produced in any form, any size or any power, flexible or rigid, based on the individual design and the packaging requirements of our customers for power plants and building integration", explains Odersun CEO, Ramin Lavae Mokhtari. This month, the Federal Trade Commission is looking at carbon offsets. Demand is booming for these green credits, where customers cancel out their greenhouse gases emissions by paying companies to preserve forests or subsidize renewable energy. Critics wonder, however, if consumers are really getting what they are paying for.